Plans have been approved by the Government, to enable learner drivers to have lessons on UK motorways and will start from next year. The Department for Transport (DfT) has said that learner drivers will be allowed on motorways from 2018 and according to transport secretary Chris Grayling, the new plan will help improve road safety here in the UK. As of 2018, learner drivers will be allowed to drive on the motorway in a dual controlled car, with a fully trained instructor. 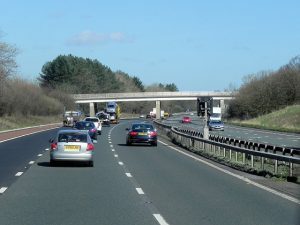 Learner drivers to have motorway lessons from 2018 © Copyright David Dixon and licensed for reuse under this Creative Commons Licence. It’s been reported that before the move was approved by the Government, the DfT discussed their plans with instructors and learner drivers and they received huge support overall. According to research, younger and more inexperienced drivers were found to be around five to seven times more likely to be seriously injured or killed, compared with drivers aged 25 or over. Mr Grayling stated that the UK has some of the safest roads in the world and would like to make them even safer, claiming lack of experience plays a huge role in why those under the age of 25 are more than likely the ones to be involved in an serious accident. “Allowing learners to drive on motorways in a supportive environment will help them develop a practical understanding of how to use motorways safely before driving independently,” added Mr Grayling. Allowing learners to practice driving on what are the country’s busiest and fastest roads will not only help to improve road safety but will provide learner drivers with the confidence to use motorways once they gain their full driving licence. Please click here to find out more about our car leasing services and fantastic deals, or give us a call on 0800 311 8290.